Add color for a unique short style. If you are ready for an exciting and unique hairstyle, consider short scene hair. You want to express yourself and stand out. Scene hair is the way to do it. Did you know that the scene cuts you admire are a pop culture revolution? Your Grandma wore a flower garland in her hair at Woodstock, your Mom had the big curly perm at the Boss' concerts and you are wearing purple hair highlights in your choppy emo scene hair cut. Scene hair is as much about fashion as it is about music. Hairstyles are being created around music themes such as indie, emo, heavy metal, and rock. Scene hair is unique because it means something different to each person. For you, it might mean goth girl meets emo but to your friend it might mean a bed-head indie haircut. Whatever your idea of scene hair, you can find a hot look. Scene hair is about attitude and expressing a love of individuality. It's the hair to have if you want a unique style because these styles can be personalized and most short scene cuts can be styled many different ways. Since there is no standard scene haircut, scene hair can be achieved through a number of different haircuts and styling techniques. 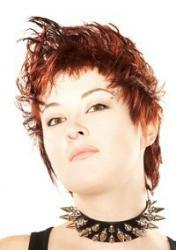 Choppy cuts: Short choppy styles that are teased with a lot of texture work well for scene hair. Chunky layers: Scene hair can incorporate a shaggy look with chunky layers with obvious separation and body. Long bangs: Bangs or fringe that covers both eyes creates popular scene look. The long bangs can also just cover one eye and still achieve the look. Colorful extensions or accessories: Brightly colored hair extensions or a few strategically placed clips, sparkly hair jewelry, or bows can heat up a short scene style. Spiked hair: Spiky hair creates a great scene look for guys. Messy hair: Guys and girls look good with the artfully wild hair. Mixed textures: Straighten the hair by your face and spike up the rest of your hair to mix textures and create dramatic short scene looks. Bright rainbow hair colors: Dye your hair a vivid color like turquoise, hot pink or deep purple. The colors stand out on cute choppy short scene hair. Color your all of your hair or put in streaks of color. Jet black hair: Color your hair as black as night, which looks especially goth scene when contrasted with pale skin. Stick straight: Short, flat-ironed straight hair looks very striking. Spike up a scene style. Crimp the back of your hair and keep the front straight. Add one black streak to the front of your hair. Spike your hair to look like an uncut Mohawk cut. If your short hair is long enough, create two small messy ponytails on top of your head and add ribbons. If you want to get a short scene cut, do a little research. First, make sure you go to a salon that does scene hair. Some salons that cater to an older crowd do not even know what scene hair is. Find out where all the local people with the scene, emo, and indie cuts get their hair styled. Even if you find a salon that understands scene hair, it's still a good idea to bring a picture of the short scene hairstyle that you want. There are endless options for short scene hair. Once you find that exciting haircut, you can find so many ways to make your scene hair look different every day.